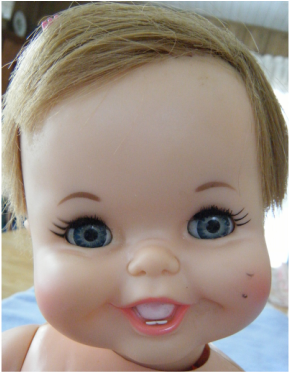 Tubsy is an Ideal doll produced in 1967 and 1968. Tubsy is unusual in that she is a battery operated doll that sits and splashes her arms in a tub of water - generally something that does not go well with electronics. The mechanism is ingenious. When the doll is lowered into her tub of water (the doll is marked with a water level line) water rises up a hole in the doll's bottom and raises a float. 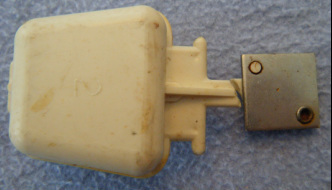 The float closes a switch and the motor turns on. 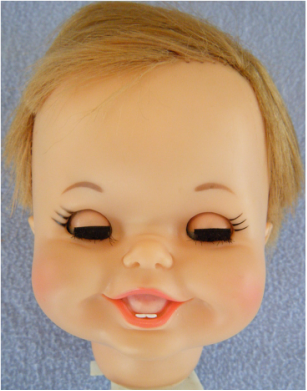 The motor causes the doll's arms to make a splashing motion as well as causing the head to move side to side. The patent does not show the legs being powered - so they would not kick. When the doll is lifted out of the water, the water drains out of the doll, dropping the float, thereby deactivating the motor. The doll came with her tub. 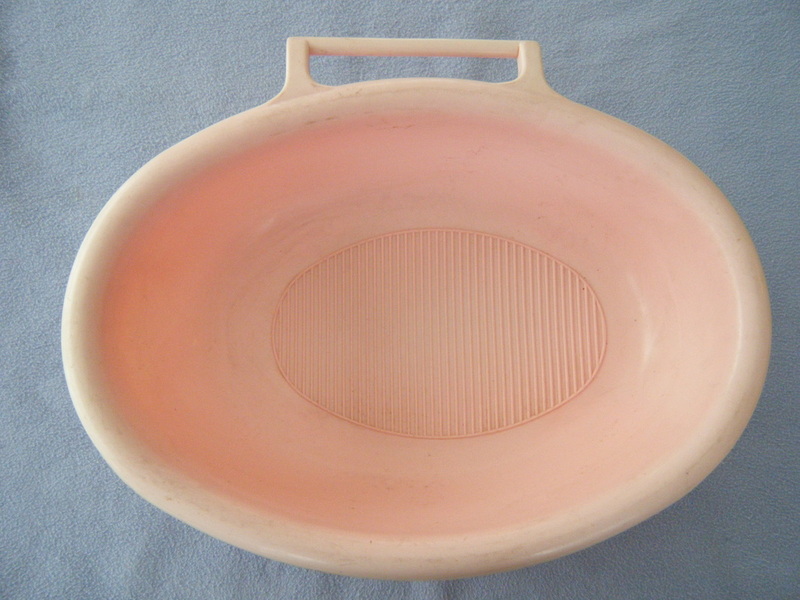 The tub had a handle and a lid so that it could double as a carrying case and a dressing table. 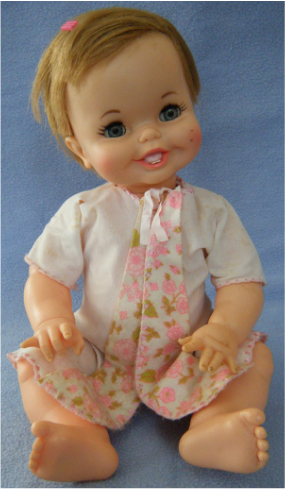 It is hard to find definitive information on this doll but the 1968 version was called "Playtime Tubsy" and came with a magnetic blue bear accessory. This accessory would attract the metal plate on the float switch and make the doll move her arms and head when she was out of the water. Tubsy's hands would strike the jingle bells dangling from the bear's arms. Also, some lids were made with a colored "Tubsy" logo. I suspect these are rare and might have been eliminated to cut down on manufacturing costs. My sister acquired Tubsy and her bathtub through separate eBay purchases. Both were quite dirty. 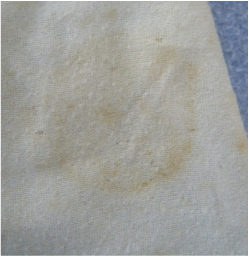 In this section, I will show some images of the cleaning process. Another section will cover the troubleshooting process - since the doll was purchased as non-working. Here is what Tubsy would look like sitting in her tub. Side view of the tub and towel bar before cleaning. 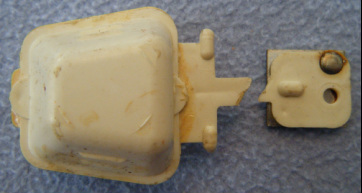 This is a top view of the tub with its cover in place. It is rather dirty. 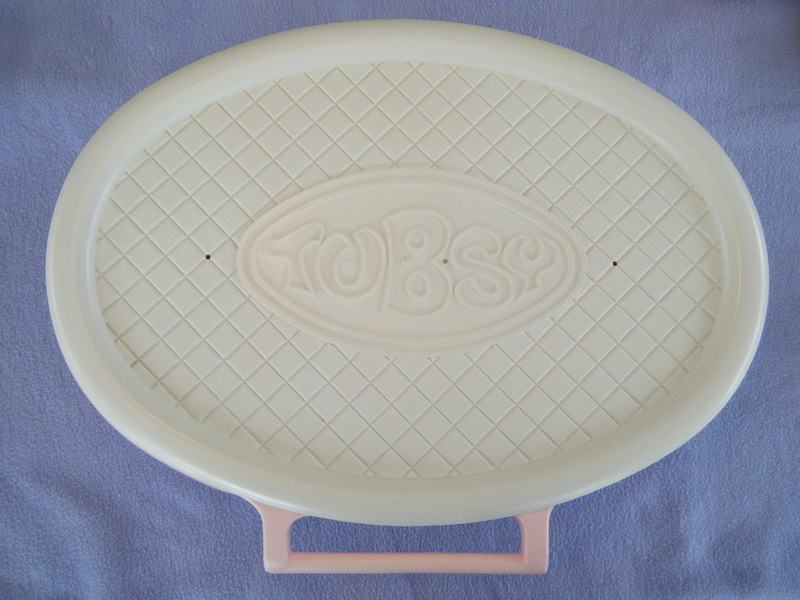 There are two small holes on either side of the Tubsy logo. These holes were probably to allow air to escape when the tub was sealed but they might have been used to support a mobile of some sort. 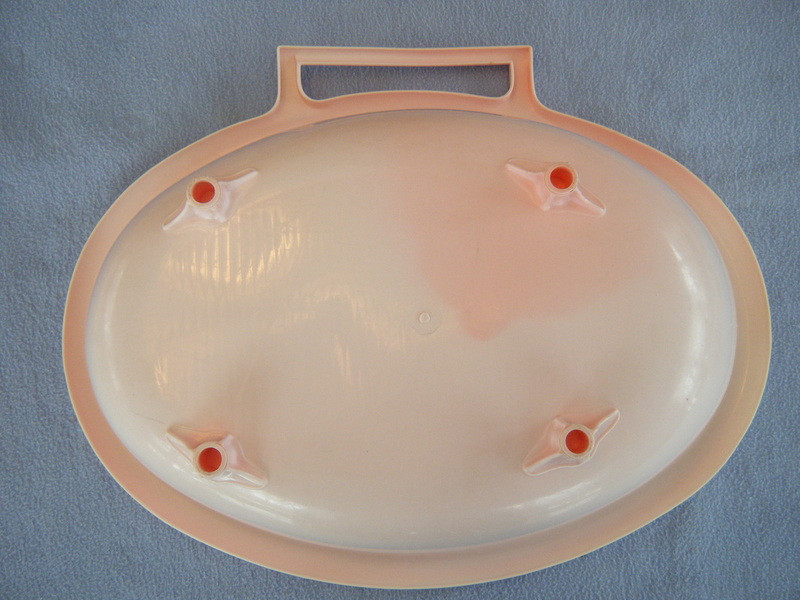 This is what the lid looked like after using doll cleaning solution. The smudges and scuffs have either disappeared or been de-emphasized. Bottom view of the tub. There is some definite signs of fading. 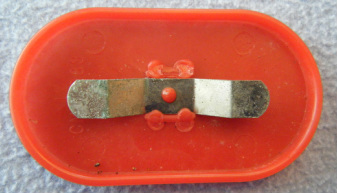 We are not sure if the original product had rubber feet that mounted on the leg posts. It would have been a good idea as the legs might have scratched countertops or kitchen tables. The cleaned tub has more shine and an almost translucent glow. 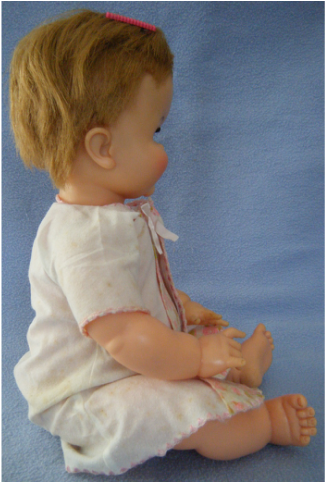 Tubsy came to us a little grubby looking - which is fine if the seller does not know how to clean a doll. Notice the marks on the cheek. It is harder to see the dirt around the hairline and around facial features. Here is the outfit that Tubsy came in. We are not sure if this is original or not. It is often hard to tell without a tag because manufacturers might have released different outfits to different outlet chains. The bath robe is certainly period if not original. Another view of Tubsy enjoying a theoretical bath before cleaning and restoration. End view of the tub and towel bar before cleaning. 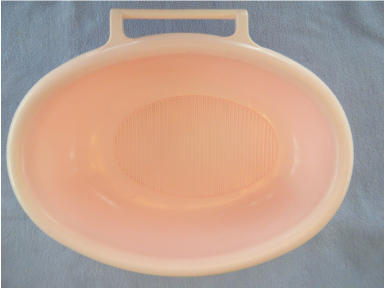 The inside of the lid was quite dirty and scuffed. Notice the red crayon mark. A much cleaner inside - no more red mark. 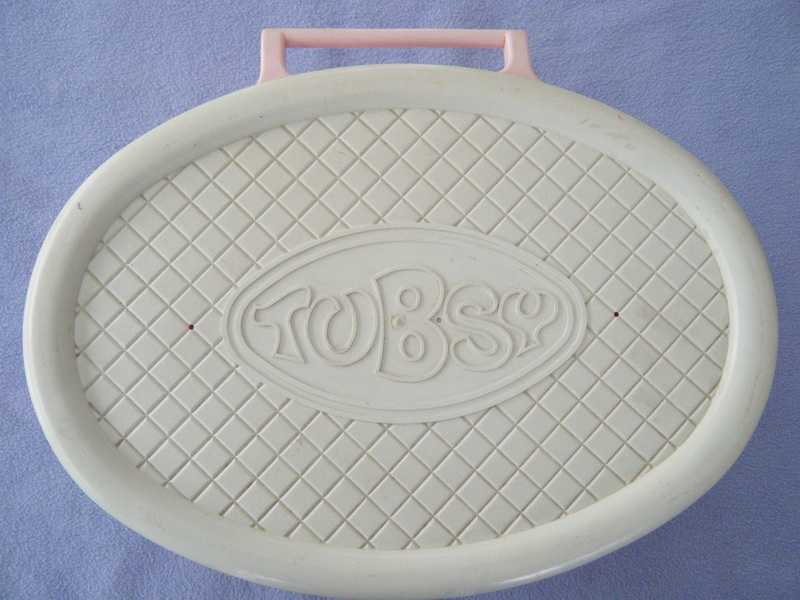 The tub is really rather large and doubles as a carrying case for Tubsy's accessories. The handle serves as a towel rack for the tub. Note the non-slip ribbed bottom in the tub. The interior of the tub cleaned up very nicely. Any waterproof doll would be happy to bathe here! A side view of Tubsy in her bath robe. The back of the robe. Notice the robe is somewhat gauzy in appearance and pretty dirty and stained. 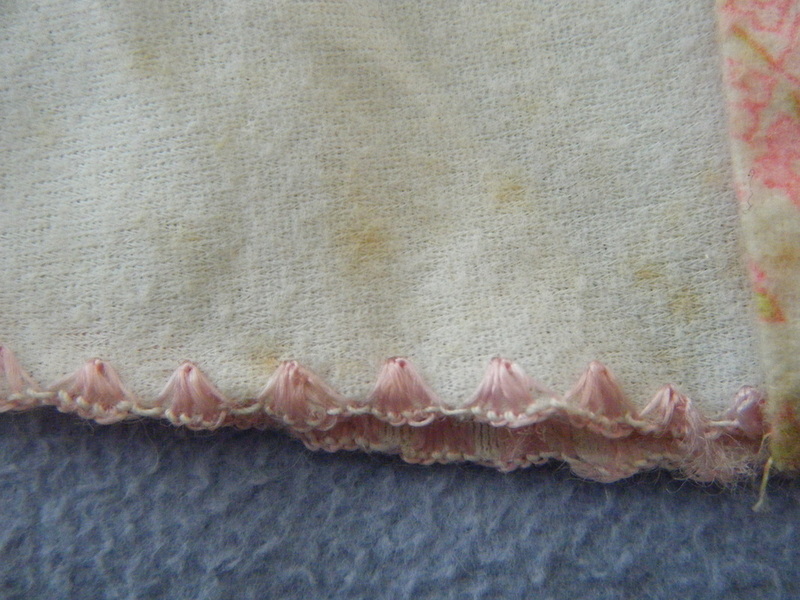 The robe has scalloped edging. It probably looked very nice when new. As much as we hoped that Tubsy would be operational when we got her, we suspected there might be problems when she had a noticeable rattle in her leg when handled. 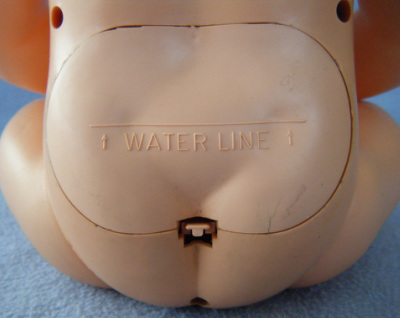 The secret to a water resistant doll is to keep the electronics in a sealed compartment - well above the clearly marked waterline on the doll's lower back. 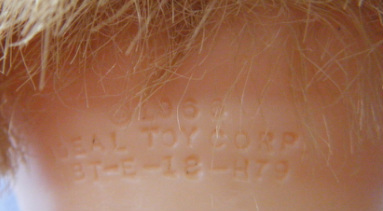 The 1967 Ideal Toy Corp. manufacturer's mark on the back of the doll. Notice the melt mark on the left side below the screw hole. Once the hatch cover was removed the true watertight compartment was revealed. There is a semi-transparent casing that slides in and out of the doll. 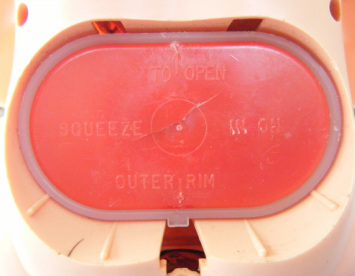 The red piece is a second hatch that states, "TO OPEN SQUEEZE IN ON OUTER RIM". I was unable to remove it without using a pair of flat bladed screwdrivers. 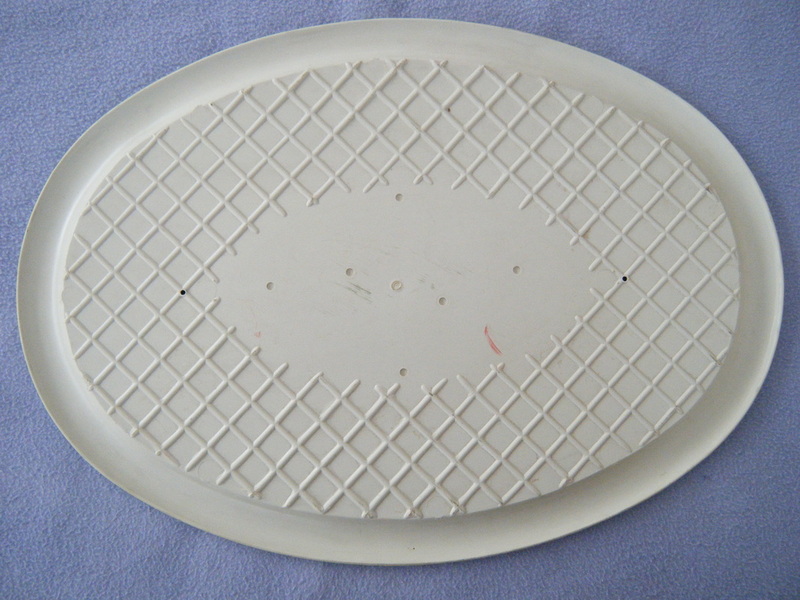 Notice that the hatch cover is cracked in the center and is no longer watertight. 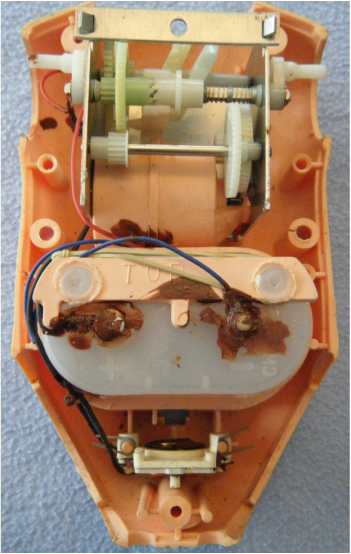 This is the inside of the true battery compartment. 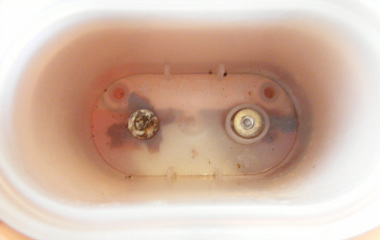 Notice that one of the contacts is pretty corroded. The brownish discoloration is on the backside of the compartment and will be more understandable in a subsequent image. Here is a close-up of the hatch on Tubsy's back. 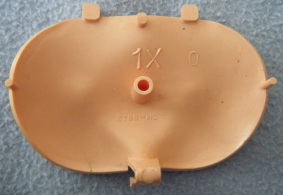 Most of the Tubsy dolls that we have seen online are missing this piece. Without this piece it would not be obvious where the maximum water level would be. 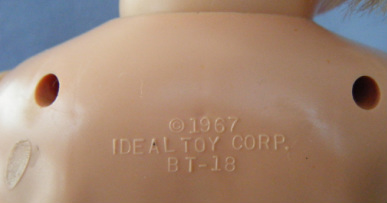 The 1966 Ideal Toy Corp manufacturer mark. 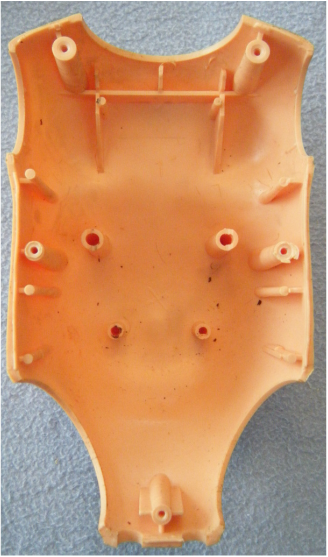 The inside of the battery compartment cover. 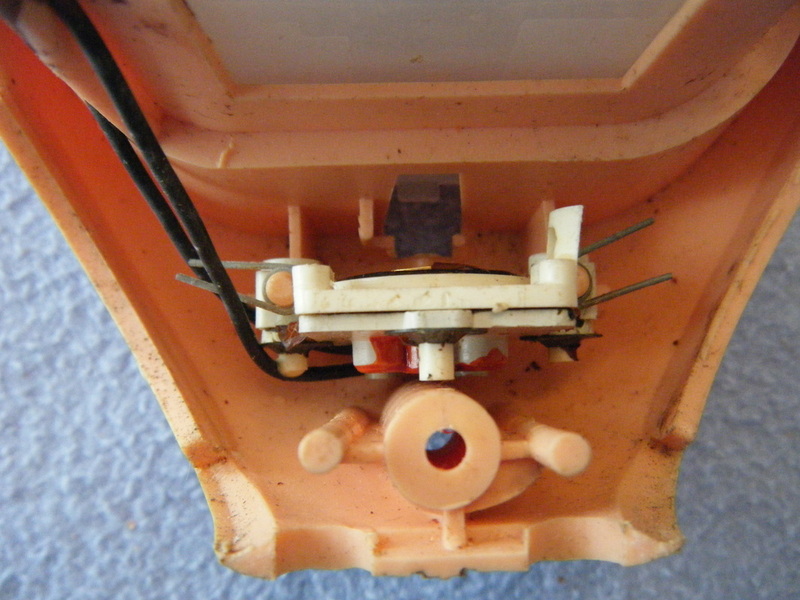 It is amazing how many battery operated dolls are missing hatch covers. 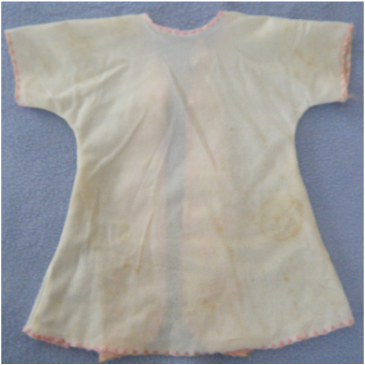 Those that were integrated into dolls seem to have survived better although those too could become separated from plastic fatigue due to repeated opening and closing. This is the flip side of the secondary hatch cover. The battery contacts need some cleaning. The stomach side of the body is uninteresting except to note the darkish spots. These also appear inside the legs. I believe they are some sort of mold or mildew caused by having the doll fill with water and not being able to dry out completely. 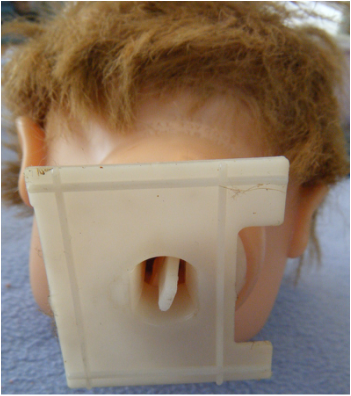 This is certainly one of the odder neck pieces I have come across in my work with mechanical dolls. 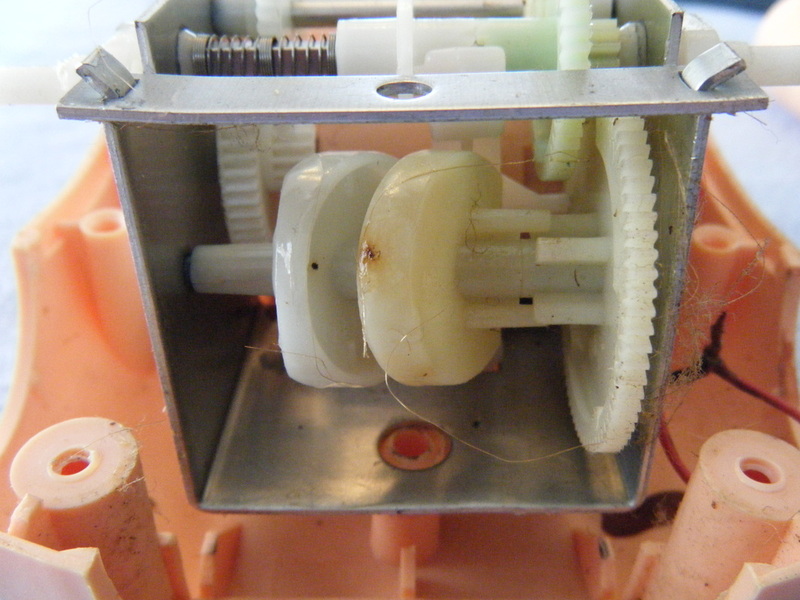 The raised white strips help locate the head properly on the rectangular metal casing of the gear box. This view is looking down into the neck. 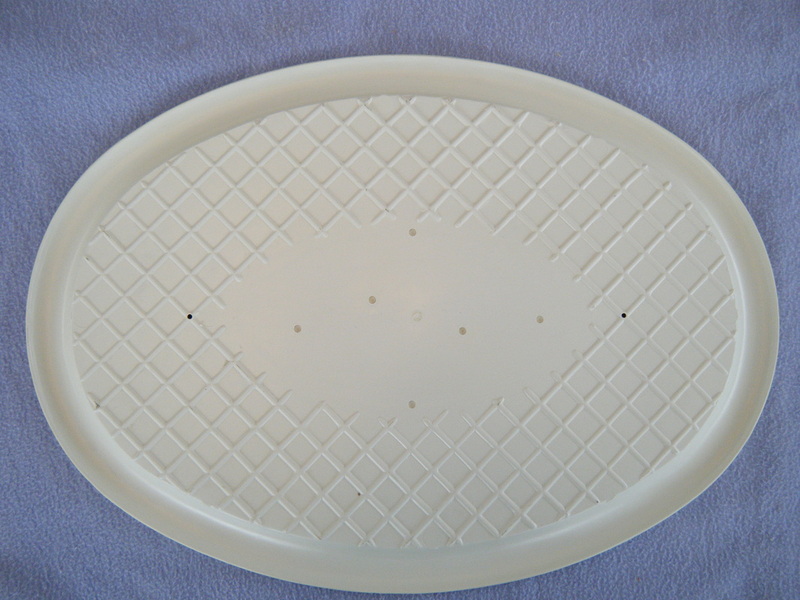 The neck paddle rides in the slots between the two circular disks. As the disks rotate the paddle is forced to move back and forth - turning the doll's head. All that fine stringy stuff is doll hair that must have gotten through the neck opening and wound up on the gear train. This was not causing the problem and was easily removed with tweezers. The claw-like white prong in the shoulder is driven by the white rod protruding from the cam on the drive train. As the claw tracks the rod the arm is forced to raise and lower - splashing water. Tubsy's legs are attached with the usual flange method. Notice the mold or mildew spots from moisture trapped in the doll's leg when it was removed from the bath water. It should be noted that some references claim that Tubsy kicked her legs. 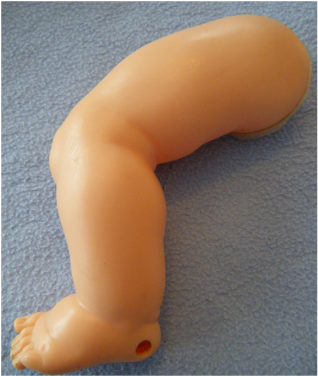 There are no mechanical or electrical parts to the legs - so motor driven leg movement was not possible in this doll. Given the limited space inside the body, I find it very unlikely that a kicking version was ever made. I was a little surprised to find a rubber band inside the doll. It is the putty colored loop next to the blue wires. I think its purpose is to keep the battery compartment from completely falling out of the doll. I should mention that when I jumpered the motor directly from the battery the doll ran fine - the head turned and arms flailed. The problem had to lie elsewhere. A close-up of the float. The float is similar to a fast food burger carton - except glued closed. The capsule like protuberances in mid-section are pivot points. The thin neck is the weak spot that broke. The back side of the body reveals the inner workings of Tubsy. 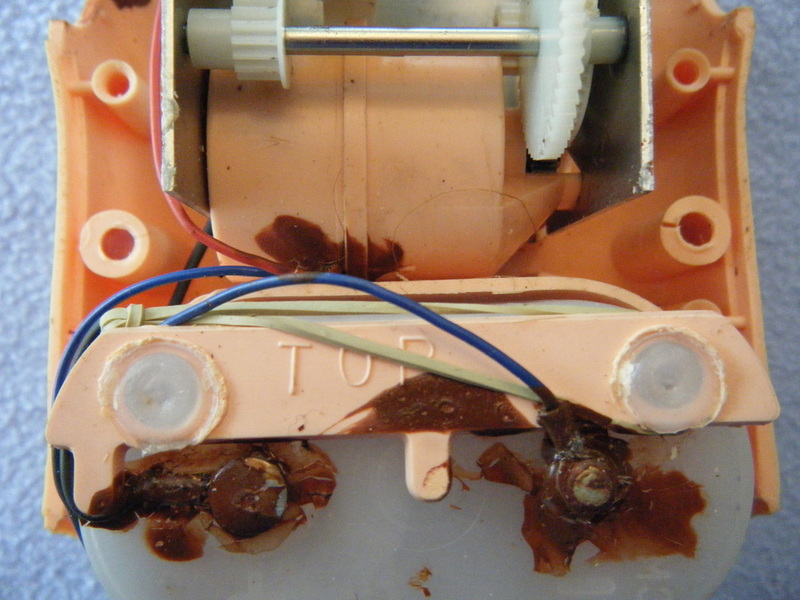 I believe the brown blotches to be a water proofing compound encasing the electrical contacts. 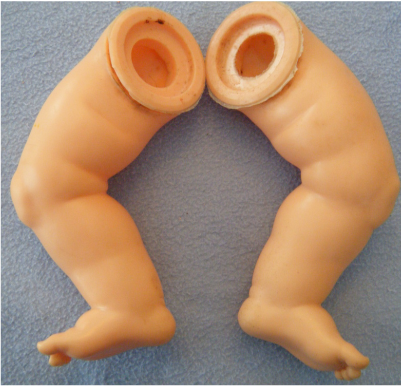 The reason the doll is not operational is connected to the section between the hip joints. More on that in a moment. 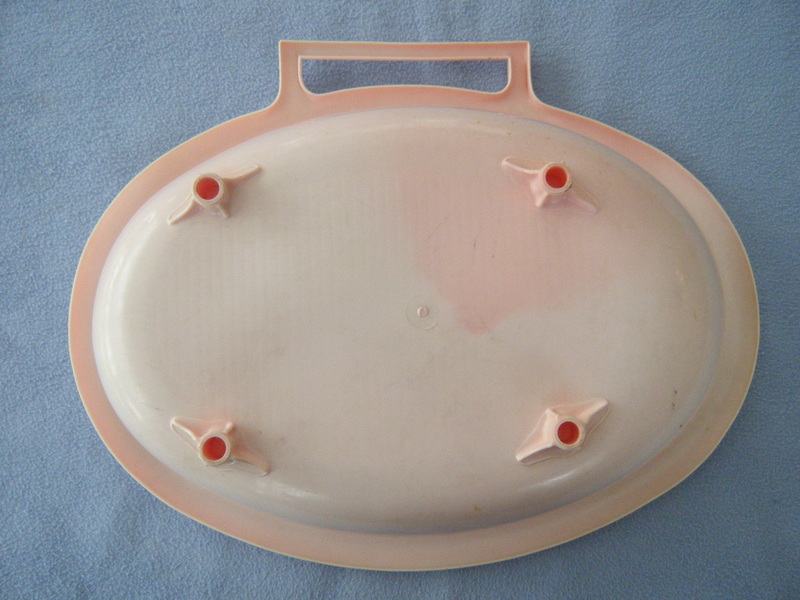 The white plate is part of the neck movement mechanism. The notch on the right side provides clearance for a gear protruding from the body cavity. The white paddle in the central hole is what turns Tubsy's head back and forth during her splashing action. 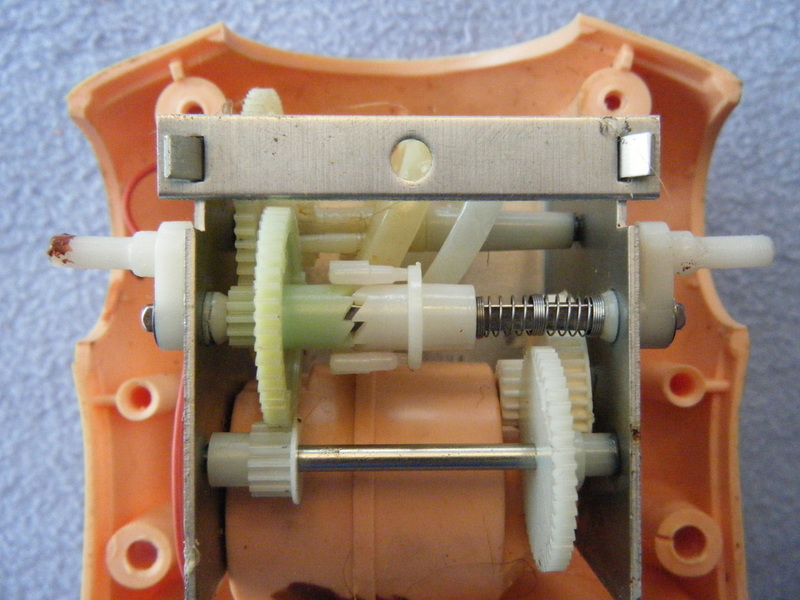 The back view of the mechanism reveals some interesting gearing. The doll's motor is encased in the flesh colored drum at the bottom center of the image. As the motor drives the gear train, the jagged looking meshing shaft in the center allows the arms and neck to move individually and then together again. The white rods projecting through the shoulder openings are offset from the axle driving them and are responsible for the arm movements. Notice the toothed edge where the vinyl arm meets the white insert. This allows the arm to properly indexed for splashing. Tubsy has interesting heels - they have holes in them. The hollow doll would tend to float in the tub so the legs needed to be able to fill with water to let the doll sink. 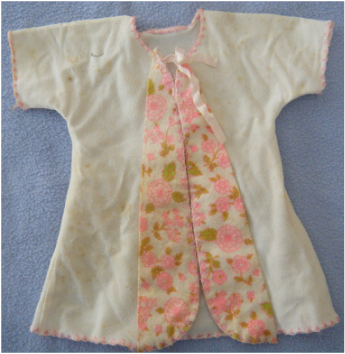 Displaced air probably exited through the doll's loose neck joint. Conversely, water would also drain from the heels when the doll was removed from the tub. This is the where the problem lies. The doll has a float activated switch inside it. It sits in the white region of the image. When the water level rises inside the doll the float rises up, closes a switch, and sets the doll in motion. The float in this doll broke off and dropped inside a leg - hence the rattling noise. 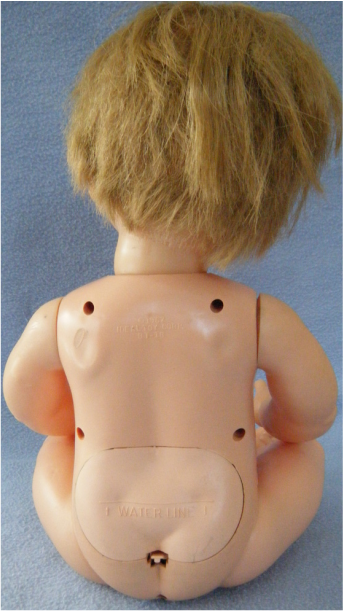 Notice the dual fill/drain holes in the very bottom of the doll. The flip side of the float. The metal plate is what closes the switch when the float pivots upward. I am going to try to fix the break with epoxy, a thin doubler, and a winding of thread.